Heat oven to 350°F (325°F if using a dark non-stick muffin pan). Spray 18 regular-size muffin cups with cooking spray. In medium bowl, mix brownie mix, oil, water and eggs. Spoon 1 tablespoon batter into each of the 18 muffin cups. Cut eighteen 3/4-inch slices from the bananas. Set one banana slice, flat side down, into the center of each muffin cup. Pour a heaping tablespoonful of brownie batter over top of the bananas. Bake for 20-26 minutes until the edges look set and a toothpick inserted near the edge of a cupcake comes out clean. Cool 30 minutes. Run metal spatula around edge of each brownie; lift out to remove from muffin cup. To make peanut butter banana brownies – spoon 1/3 cup of creamy peanut butter into a small zip top bag. 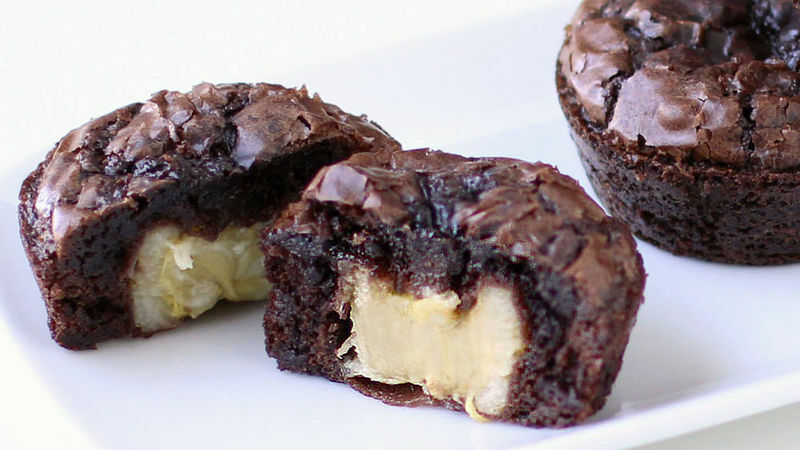 Snip off one tip and pipe some peanut butter around the edge of the banana before topping with brownie batter. Bananas and chocolate are a perfect match. Don't you just love those frozen bananas dipped in chocolate and served on a stick? Or how about chocolate fondue-drizzled banana slices? Yum, right? So, why not combine the ultimate chocolate dessert, a brownie, with a banana? Yes, let's do that, but make them individual cupcake sized treats, so with each bite you enjoy a nice crispy edge and an ooey gooey chocolate brownie with a pop of tropical freshness from the baked banana. If you want to really ramp up the flavor, add some creamy peanut butter. Chocolate, banana, and peanut butter? Oh, yeah! These desserts could not be easier to make. You just need to mix up a Betty Crocker Dark Chocolate Brownie Mix according to the package instructions. Spoon about a tablespoon of the batter into 18 muffin cups, that have been sprayed with cooking spray, and add a 3/4 inch thick slice of banana. Top the banana with more brownie batter and pop them in the oven. If you love the peanut butter and banana combo, pipe some peanut butter around the banana before topping them with the brownie batter. The brownies will be baked in about 20 minutes and the incredible smell with fill your kitchen. It will be so hard to resist eating one while they are piping hot, but it's best to let them cool slightly and set up a bit. They are really incredible while they are still warm, though, so once they've rested 15-30 minutes, run a thin knife or spatula around the edge of each brownie and lift them out of the pan. When you bite into the brownie, the banana will be soft and creamy. If you added peanut butter, you'll enjoy the peanutty flavor with each bite.